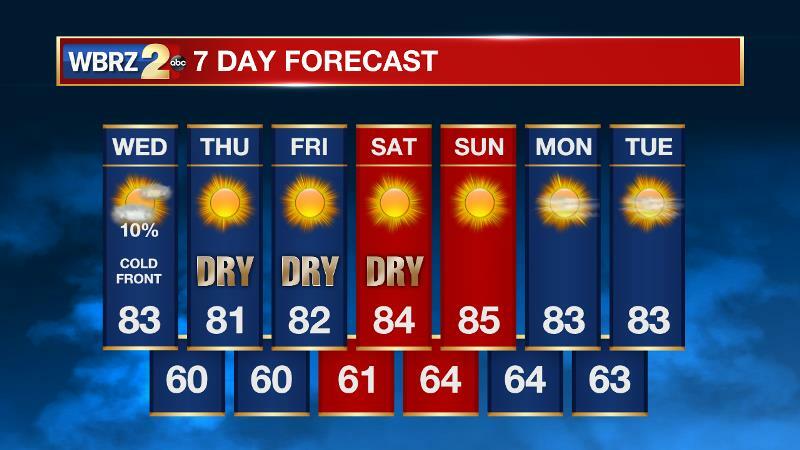 An extended stretch of comfortable, quiet weather is ahead. Meanwhile, powerful Hurricane Irma continues to pose a threat to the Southeast U.S. The Tropics: Hurricane Irma has a minimum central pressure of 918mb, with maximum sustained winds of 185mph and is moving west, northwest at 16mph. Overnight, the official forecast from the National Hurricane Center finally started to indicate a right turn that the WBRZ Weather Team had been mentioning for the last several days. As Irma approaches the United States, a cold front and associated upper level trough of low pressure is expected to snag the storm, and begin to steer it north. Exactly where this occurs is still uncertain, but trends over the last few days have suggested the shift happening near South Florida. Threat to the Baton Rouge area remains very low. Still, the WBRZ Weather Team always encourages hurricane preparedness and staying connected to the forecast. The WBRZ Weather Team is here for you, on every platform. Your weather updates can be found on News 2, wbrz.com, Facebook, Twitter and the WBRZ WX App. on Apple and Android devices. Elsewhere in the tropics, two other named storms have shown up in the Atlantic Basin. Tropical Storm Jose trails, Hurricane Irma in the central Atlantic. 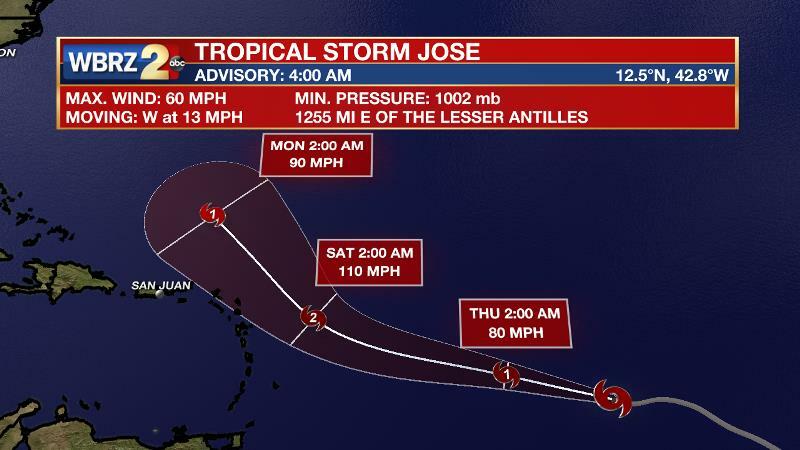 This storm is expected to take a more northward jaunt out to sea. Closer to home, Tropical Storm Katia has formed in the southern Gulf of Mexico. 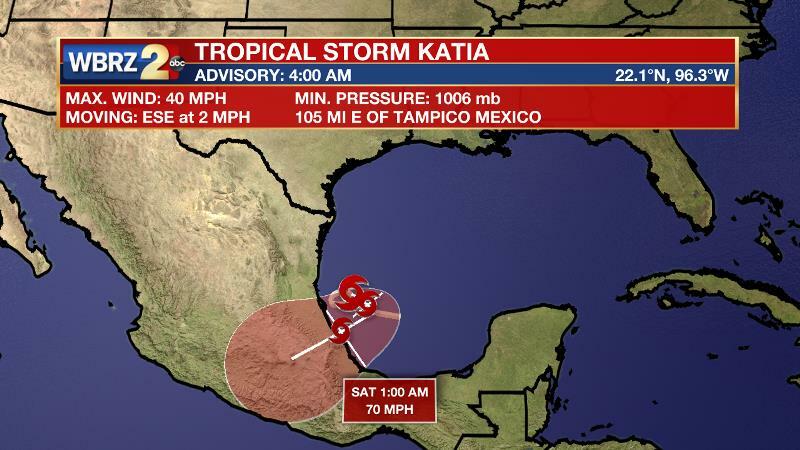 Katia may strengthen some before drifting south and west toward Mexico. Local Forecast: A cold front will slowly cross the area on Wednesday. Scarce showers that do develop along the front will end from north to south and skies will clear accordingly. Northerly winds will transport cool, dry air into the area and a much different feel will be noticed by evening. High temperatures will remain in the low 80s and overnight low temperatures will slip all the way into the low 60s. Some usual cooler spots north of I-12 could briefly drop into the upper 50s. Thursday through Saturday will bring clear skies, highs in the low 80s and lows in the low 60s. Weather for the first LSU Football home game looks fantastic, normally in early September we sweat and sweat some more—but not this year! By Sunday, a few high clouds may begin to show up due to a weak disturbance in the upper levels and the outer reaches of Hurricane Irma. As a deep, anomalous trough digs into the eastern United States, a cold front will be driven through and southwest Mississippi southeast Louisiana early Wednesday, into the Gulf of Mexico by afternoon. Northerly winds will bring in some much welcome dry and unseasonably cool air that will last through the weekend. Surface high pressure will move from the Mid-Mississippi River Valley to the Northeast U.S. Thursday to Sunday maintaining northerly winds and the clear, comfortable conditions. A strong short wave will round the top of an extensive upper level ridge over the west coast and dive into the Deep South over the weekend. This could have an impact on our area in the form of some continued and enhanced northerly flow aloft with a few showers by early next week but sinking air on the outer edges of Irma could actually negate development and simply maintain cooler and quieter weather. It is worth reiterating that, as of this forecast, Irma is still NOT expected to pose a threat to the central or western Gulf Coast.